What do we sacrifice to do what we are called ? We got a few months of free HBO a while back so we got to watch “The Newsroom” for free. Even though it is hard to see Jeff Daniels (who plays anchorman Will McAvoy) and not envision him on the toilet in Dumb and Dumber, it’s a great show. 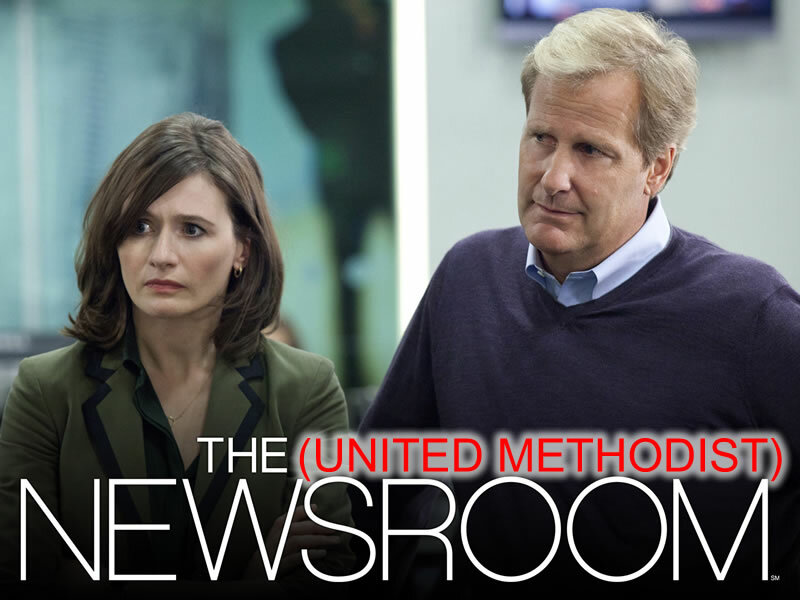 The show is a character drama about a fictional newsroom struggling to keep its journalistic integrity while combating the sensationalism inclination of other studios. Fascinating. For the first seven episodes, they resisted the temptation towards sensationalism. But on the eighth, something interesting happens. They were talking about the network suffering a massive ratings drop because they refused to cover the Casey Anthony story. I kept on wanting to replace “network” or “show” with “The UMC” and “audience” with “membership.” Statements like the head executive Charlie saying “Half our audience changed the channel in one week” would easily reflect the conversations over the Death Tsunami. So I began to perk up and see what parallels our church might have with this television show. Read on for the dilemmas and how they inform the church’s direction as well. To Mac in that exchange, she isn’t willing to sacrifice who their network fundamentally is (to her eyes) on the shallow altar of a goal. The goal is worthy and Mac undoubtedly wants to change the system the same way Will does. But she recognizes that if they go down that path, forever will it dominate their destiny. Forever will it push them towards sensationalism and becoming another cog in the news-entertainment complex. The ends do not justify the means. But Mac is overruled and the network covers the Casey Anthony story so they can host the Republican Debate. We see in Episode 9 if they got it (I won’t spoil it). The dilemma above is about selling out principles for short-term gain (or even long-term gain) in order to do something unique and special. It’s a utilitarian perspective: Do what works in order to do what is best. The ends justify the means. I got a newsletter from a church in my home state. It has six Sunday morning education opportunities for adults. They were studying Beth Moore, Ray Vander Laan, Francis Chan, Edwin Cole, Joyce Meyer, and Kay Arthur. Zero United Methodist curriculum or authors or even perspectives. How can a church get a distinctive Methodist identity if its Sunday morning education is filled with interdenominational (or flat-out Baptist) perspectives? Follow along with whatever fad religious thing is of the moment (The Shack, The Prayer of Jabez, and other popcorn theology) rather than offering a mainline theological perspective. Why would churches choose to do these things that (to seminary-educated clergy) are clearly not in the Methodist vein? I believe there is a tremendous pressure on mainline Methodist churches to accomplish the things that are special/unique/expressive of our denomination. To do the work of disaster relief through UMCOR and assembling relief kits or financial donations. To offer a balanced theological perspective in a Wesleyan tradition. To stick a finger in the overflowing dam of dangerous theology like Neo-Calvinism and Prosperity Gospel. To maintain institutions of education, medical, and research initiatives. To (sometimes) offer a safe place for youth that are ran out of other churches because they are gay. I cannot help but wonder if there are pastors who put up with the list above to do the paragraph above. Who put up with what they know is an un-Methodist and un-helpful theology in their pews and classrooms so that they can accomplish the distinctive aspects of United Methodism. And church metrics encourage it. When any area is evaluated by higher-ups solely on “numbers” then we end up with technocrats who make decisions based on the “ends” rather those who seek a wholly authentic church experience from pulpit to pew to classroom to outreach. And the itinerancy system encourages it. When laity claim that “it’s been done in the past” sometimes it is harder for clergy to resist allowing certain studies, events, or teachers into the fold. Then since it was allowed once, then it is allowed again, or lies low until the next clergyperson change. So the Methodist dilemma is really every denominational church’s dilemma: to accomplish yourparticular faith traditions goals, sometimes you choose to entertain non-denominational activities that boost attendance. And sometimes it isn’t about non-Methodist things, but about accommodating the empire-building aspects of the church to accomplish the missional good. I’ll close this section with an anecdote. A clergy friend of mine served a large church that was in a capital campaign to expand into a new sanctuary. She went with the church on a VIM (Volunteers In Mission) trip to be in mission overseas. She witnessed abject poverty and horrible living conditions and the sheer joy they had over just having a bible and clean water. She then returned and was nauseated over the materialism of her local church and the millions of dollars being pumped into a new sanctuary that could save real lives overseas. After some soul-searching, she justified it by believing that it would bring in more people and more dollars and more opportunities could be had to send more VIM trips overseas. At least five years later, as I recall, that church has grown steadily…but still does only one VIM mission trip a year. In the Newsroom episode, because Casey Anthony gets half the show’s coverage, all the other stories get cut or shortened. This gets under Sloan’s (the financial analyst) skin as she is trying to talk about the fiscal crisis with the debt ceiling. There’s a terrific passionate scene where Sloane tells Mac why it is so imperative that they cover the actual news. I worry that even as we make these deals and do non-Methodisty things so that we can accomplish really Methodisty things, Are we ignoring that we are giving people spiritual fluff? Are we not equipping people for the postmodern world? Or worse, are we not giving enough time to real life-giving theology, steeped in the Wesleyan (or whatever denomination) tradition that offers real living lenses to make sense of the world? Are we giving too much time to Calvinism that dis-empowers people, particularly women? Are we not giving enough tools to combat the Prosperity Gospel and its predatory theology over those less informed and unlucky? Are we like Sloane and want to give enough time and effort and bandwidth of our worship, study, and outreach to lift up truly life-giving theology…but keep getting lost by the flash wizardry of those more charismatic but less substantive? How do we navigate it? My hope is that every clergy and every laity realizes that they are making a choice. They are choosing to satisfy the crowd. While I lean towards populism in many aspects of my life, sometimes the crowd doesn’t know what they really need. And the church universal and local would be reinvigorated if they spent more time on what truly satisfies rather than these half-hearted theologies that sound good but leave ash in your mouth. I don’t know all the teachers you mentioned in the church newsletter, but I would not consider Beth Moore, Kay Arthur, or Francis Chan “spiritual fluff.” (Non-Methodist in theology, yes, but deeply engaging Scripture.) As I see it, the problem is not always that we are going with superficial or flashy programs, but that there are not good programs and studies available that present a Wesleyan, United Methodist theology. Disciple Bible Study is a glowing exception. Abingdon is coming out with some new women’s studies from UM female pastors (like one of my pastors, Jessica LaGrone) to help fill this void. I would like to see us identify and promote good quality resources that are consistent with our theology. In fact, Good News is getting ready to do that through a new website, Wesley21.com. We hope to be online within the next six weeks. One of my biggest frustrations is the interest in the “fluff” instead of actual theology. In the area where I live, there are almost no studies not based on this fluff. I’ve quit participating! After a lifetime of enjoying studies I am saddened, especially by the ignorance of the people around me. Not in the Wesleyan tradition at all. After reading Tooley’s accusation against the bishops being echo chambers of popular culture, this feels sorta like the opposite but equal response. I’m not sure if it’s really helpful to equate non-Methodist with ‘fluff.’ I think what a lot of UMs are saying is that we don’t really have many good preacher-theologians to look to. You have to admit that your article is noticeably devoid of UM alternatives. Who can we turn to that is as engaging as the ones Mr. Lambrecht defends? I don’t honestly know. Do you? At this point, after calling someone else ‘Methodist kudzu,’ I think it’s understandable for someone to read a bit of an elitist tone in your writing. I would also take issue with your pointing to mission work, balanced theology, and social advocacy is distinctly Methodist phenomena. Virtually every other denominational movement in the US has a claim to those same things. I think it would be easier to argue that if anything, church metrics is distinctively Methodist, as Mr. Wesley was one of the first to even care about metrics. “Method” is the root word of our movement. The fact that you equate church metrics to covering fluff pieces on the news says to me that you lack any empathy for those who wish to see ministries bear fruit. You really believe that assessing pastors based on confessions of faith, attendance in worship, and giving toward mission will result in a denomination of technocrats. But surely know that those who promote metrics are not trying to create this. Rather, we are trying to end a long streak of facilitating impotent ministry. Ministry that is marked with the Spirit is not populist, but it does flourish. Nobody wants a zeitgeist theology, but some do believe that the days of Pentecost are not over. We believe that the Holy Spirit evidences itself with fruits, as both the New Testament and Mr. Wesley stipulate. That means we should be able to observe and quantify where the Pentecost still flourishes. I think that if you’re really wanting to effectively combat the trend toward church metrics, you need to be able to prove that it is 1) not scriptural, 2) not Methodist, and 3) not able to adequately gauge the fruits of the Spirit. If you effectively made any of those cases here, I didn’t read closely enough to see it, and I apologize. I suppose it’s a matter of where you set your bar for the “poison,” to borrow the character’s word. How much damage will this choice cause, and how much damage am I willing to take to achieve a larger goal? Does my ability to later mitigate or repair the damage affect my choice? Is the larger goal actually worth the damage? I suspect trying to answer those questions in a one-situation-fits-all mode won’t work very well, although some general guidelines would probably be useful and are needed. After a lifetime in the Methodist/First Methodist/United Methodist Church family, I find myself wondering where did all the loving embracing messages go? When did UMC become the righteous right with the overt political screening of extremely biased and lie- filled films. I was fortunate to grow up in the church. For as long as I remember I have always believed in God, in Jesus Christ my lord and saviour. I learned as a teen that individual pastors were fallible but the church was always in harmony in with God. I no longer believe that. I walked away from UMC this year and am searching for the church I knew. I am not lost, because I know God is with me, but I no longer feel like the Methodist faith is on the true path of God. For that I am sad.